If the success of the people behind the Thirty Meter Telescope (TMT) project is any measure, this planned next-generation astronomical observatory looks set to accomplish a great deal. The latest accolade is the awarding of a 2012 Franklin Institute Award in electrical engineering to the TMT project scientist, Jerry Nelson. The winners were announced today by the Philadelphia-based Franklin Institute, which is one of the country's oldest and premier centers of science education and development. The Franklin Institute has cited Nelson's pioneering contributions in the development of segmented-mirror telescopes as the basis for the honor. His work helped revolutionize astronomy by allowing primary mirrors, the "heart of a telescope," to become much larger. Rather than build huge single mirrors that would warp due to gravity, Nelson thought to assemble the mirror out of small segments. This breakthrough culminated in the construction in the 1990s of the twin Keck telescopes near the summit of Mauna Kea in Hawaii, also the proposed site for the TMT. The Keck telescopes each boast 10-meter (33-foot) diameter primary mirrors, still among the largest in the world. Actuators and a computer program keep all of Keck's 36 hexagonal mirrors in sync, thus acting like one giant mirror. 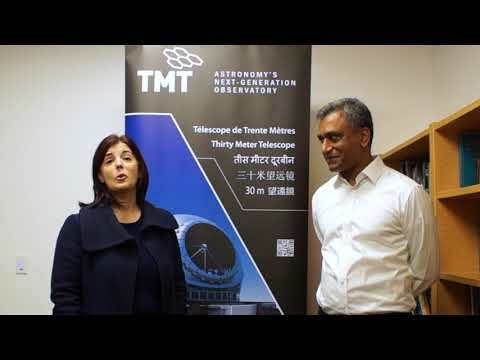 In comparison, the TMT's primary mirror will consist of 492 hexagonal segments – a tremendous leap forward, and one which would not be possible without Nelson's expertise and insight. "I am very excited about taking the segmented mirror concept to a new level with the Thirty Meter Telescope Project," said Nelson who is also a professor of astronomy and astrophysics at the University of California, Santa Cruz. "It is a great honor for me to receive the Franklin Institute Award and a great tribute to the many people who have made the Keck Observatory such a resounding success." The Franklin Institute has been bestowing the annual awards since 1874 in keeping with the organization's mission to inspire an understanding of and passion for science and technology learning. The Institute is named for Benjamin Franklin, a Founding Father of the United States and one of the most celebrated scientists, inventors and thinkers in American history. Some of the most influential names in science and technology over the two centuries have been Franklin Institute Award laureates. The list includes Albert Einstein, Alexander Graham Bell, Jacques Cousteau, Marie and Pierre Curie, Thomas Edison, Bill Gates, Jane Goodall, Orville Wright, Stephen Hawking, and Francis Crick and James Watson. Many awardees have also been recipients of the Nobel Prize. Nelson, along with other winners, will travel to Philadelphia in April 2012 for a weeklong series of events and activities aimed at familiarizing students and the community with the laureates'' remarkable accomplishments. The week culminates with a grand awards ceremony and elegant dinner, befitting the honor and distinction of this historic awards program.